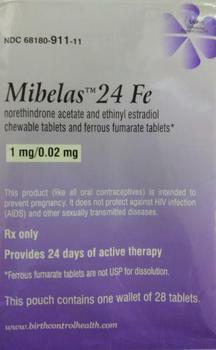 Lupin Pharmaceuticals of Baltimore, Md., is recalling one lot of Mibelas 24 Fe birth control tablets. A confirmed complaint indicates a packaging error, where the blister was rotated 180 degrees within the wallet, reversing the weekly tablet orientation and making the lot number and expiration date no longer visible. The first four days of therapy would have had four non-hormonal placebo tablets as opposed to the active tablets. As a result, oral contraceptive tablets that are taken out of sequence may place the user at risk for contraceptive failure and unintended pregnancy. The recalled product was distributed throughout the U.S. to wholesalers, clinics and retail pharmacies. Customers who purchased the recalled product should notify their physician and return the product to the pharmacy or place of purchase. Consumers with questions may contact Lupin at 1-800-399-2561, 8:00 am to 5:00 pm (EST) Monday through Friday.